Rounded depth of flavor with mouth-watering characteristics. Water, soybean oil, sugar, salt, distilled vinegar, sweet cream, Buttermilk, modified corn starch, xanthan gum, garlic powder, Onion powder, sorbic acid and calcium disodium edta (used to Protect quality), natural flavors, phosphoric acid, spices, Polysorbate 60, lemon juice concentrate, propylene glycol Alginate, yeast extract, soybean lecithin. 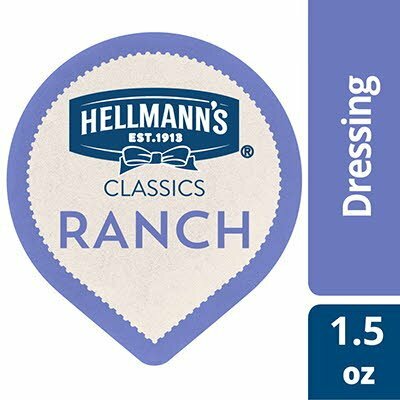 Hellmann's Classics Ranch Dressing is made with no artificial colors or flavors, no high fructose corn syrup. The Hellmann's brand is recognized throughout the world for unrivaled quality and flavor and its commitment to real, simple ingredients, like the buttermilk found in this product. Hellmann's Classics Dressings offer premium quality with shelf-stable convenience.